It's that time of year again, friends. The time of year when we stop eating burgers and focus exclusively on the once Italian but now quintessentially American meal of pizza. 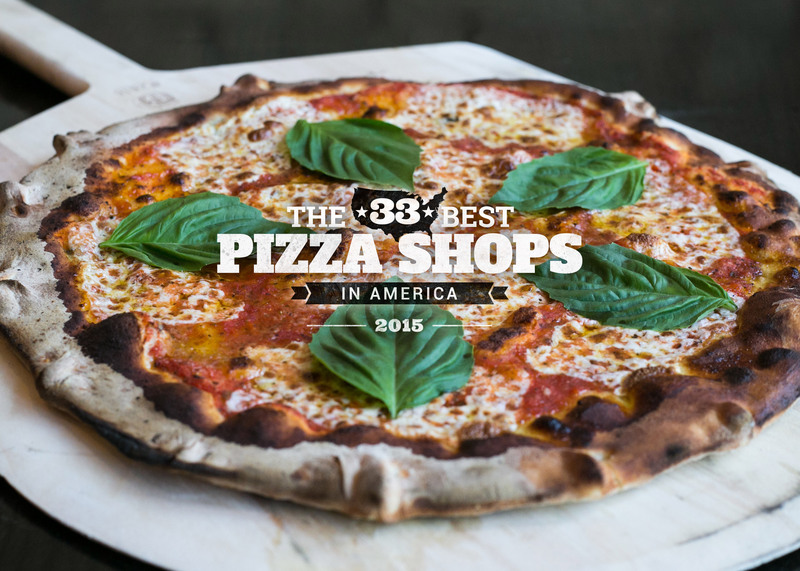 As in the past, Liz and myself and a few members of our inner pizza cabal have traveled around the country, sampling all the different beautiful iterations of pizza we have in America and picking the 33 best. Some of them are legendary repeats. Others are bold newcomers in places you might not immediately throw out in any pizza argument. All of them are delicious. As part of the excitement, we also have a pizza bracket this year, so you, the people, can exercise your right to pick your favorite from the list. Find that here. And finally, as per usual, we expect you to fill the comment section only with high praise and links to Brookstone gift certificates. Or maybe, if you have to, some suggestions on places we missed that we've got to hit next year. When I am home in Boston, I have a routine. And that routine consists of spending upwards of six to eight hours in Area Four, usually ending that time with a pizza and two to seven beers at the bar. But because I used the restaurant for so many different things (coffee, breakfast, lunch, working, drinking, etc.) I didn't even realize how much I was truly underrating their pizza until they opened their pizza specific shop in Union Square. The beauty is in the simplicity. As they say on its site: "12-year-old starter + flour + water + salt. No oil or sugar. Ever. 3 days of fermentation. Handcrafted cheese. 1 wood-fire oven." And that wood-fire oven produces some fantastic pizza, friends. Opt for the Carnivore if it's on the menu. Because even perfect simplicity can be improved by soppressata, homemade fennel sausage, and bacon. Rick Easton is a baker. And a fantastic one at that -- so much so that even The Gray Lady decided to get down from her arthritic perch above the masses to praise his pane locale. But we came for the pizza al taglio, the Roman rectangular style he's perfected along with everything else. We would love to recommend a certain kind, but they change as the ingredients that are available to him change, so we can only implore you to go in the afternoon as soon as they're ready and buy them all. There's always a line at Di Fara, which is in large part because of its reputation for incredible, handmade pies. But it's also because the founder, Dom DeMarco, now almost in his 80s, is the literal hands behind each and every creation. 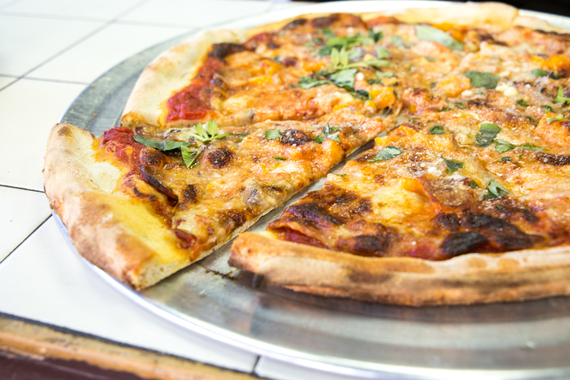 While his children are involved, the legend is the only person who has ever built a pizza here, making sauce with simple San Marzanos, sprinkling his blend of Grana Padano, mozzarella, and Parmesan cheeses, and carefully snipping fresh basil across each hot pie. Rightfully, his dedication draws Dom Dreams of Pizza jokes, but the pilgrimage for a regular pie is a better goal than any bite of sushi. Every year, we debate the inclusion of St. Louis-style pies because they're so damn strange. 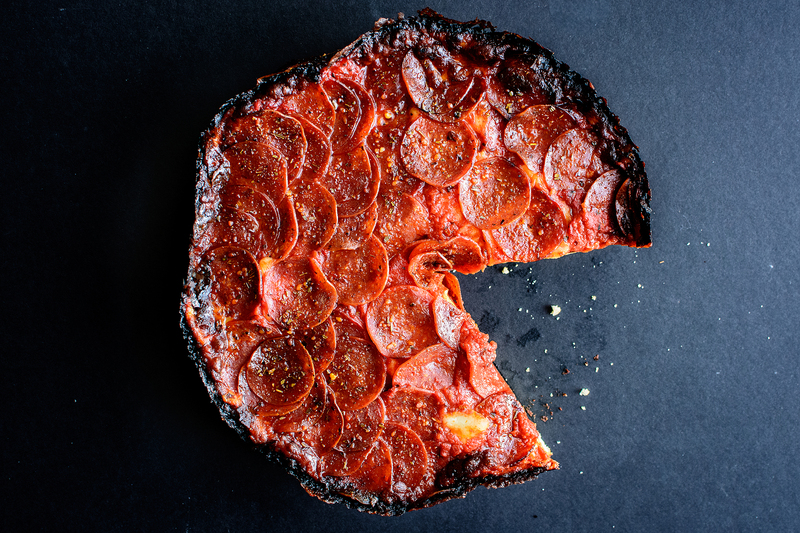 Even people from St. Louis don't seem considerably proud of their pizza in the way you might find Chicagoans or Detroiters or people from the Jersey-tomato-pie sphere. They will tell you to go to one of the fancier, Neapolitan-style places in the city proper. Perhaps it's the cracker-thin crust. Or the very sweet sauce. Or the Provel cheese that seems made specifically to get into every crevice in your mouth and stay put. But this is America, and if St. Louis has a particularly unique style, we want to celebrate it. And so we have kept the institution of Frank and Helen's in University City on the list. Added bonus: that cheesy garlic bread with melted Provel -- it's getting in your teeth anyway, so you might as well not fight it. 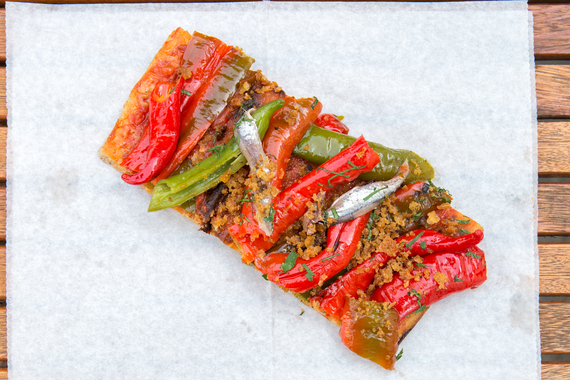 There have been rumblings in the pizza world about quality going down at Frank Pepe now that he's decided to open multiple spots (including one in Boston, YAY!). Those rumblings are false. The New Haven OG still makes some of the best damn thin-crust coal-fired pizza in one of the best damn pizza towns in America. The white clam pie is still a legend. And the original tomato pie is right behind it. Haters beware. By now you know the drill: get here at 11:30am or earlier, or face the possibility that they might run out of dough. 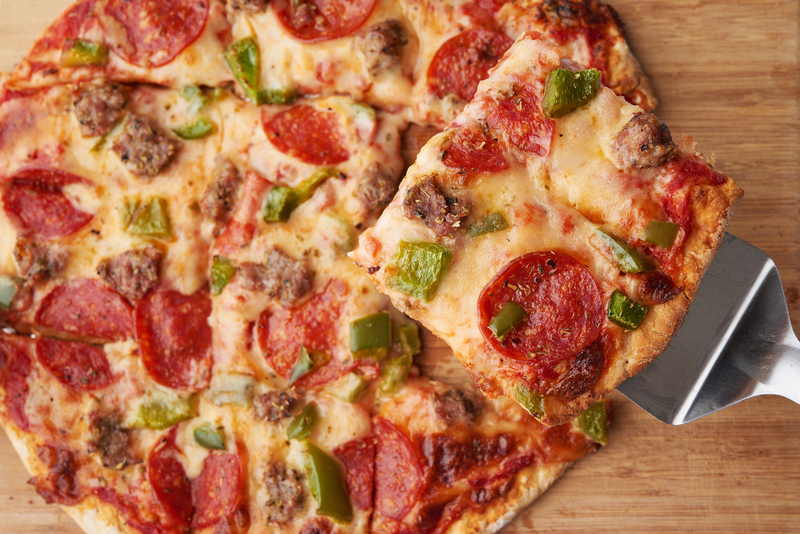 Get two slices. They will be Sicilian. Get a beer. Walk outside and ask the old Italian guys sitting on the stoop and whistling at girls if they mind if you sit on the stoop with them. Eat the pizza. Drink the beer. Don't bring up Roberto Baggio. With apologies to Buddy's and Cloverleaf, we had to include Loui's in Hazel Park. Not only was it the most beloved of all the Detroit-style pizza places when we asked a bunch of local chefs, it's also got everything else we love: a throwback atmosphere that is authentic rather than a business model, and oh yeah -- those damn fine red-top pizzas. Go for cheese & pepperoni and, depending on the elasticity of your pants, add in some sausage. 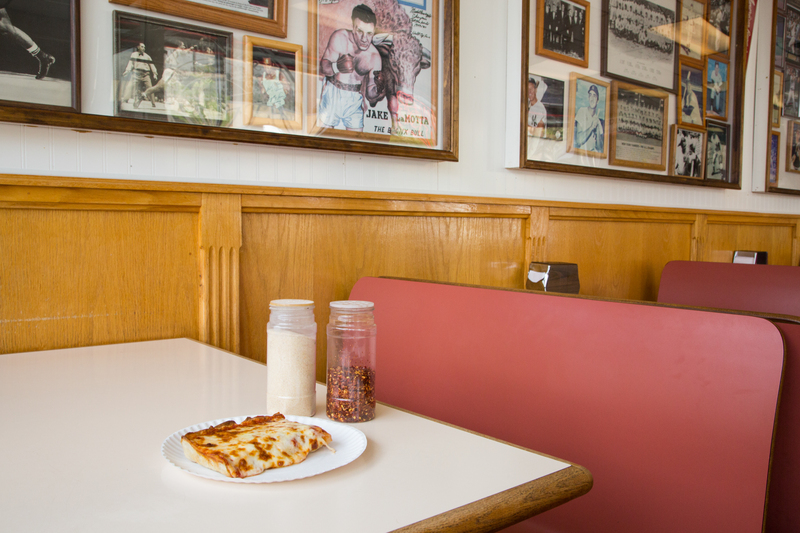 While it's not easy to live in the shadow of New York pizza, New Jersey pies hold their own thanks in no small part to Papa's Tomato Pies. First, it's important to note that this is the oldest continuously operating pizzeria in America (Lombardi's is older, but had that decade of closure), which, to us, brings the Garden State more cred than Bon Jovi, although definitely less than The Boss. 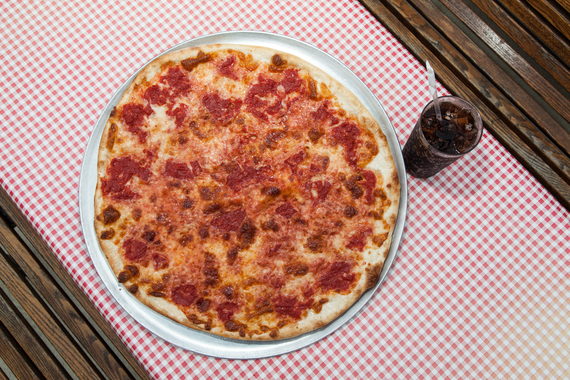 Second, Jersey has its own pizza style originating out of Trenton: tomato pie. If it's your first go around, just go for a plain pie: a light layer of cheese is added to a thin crust, then covered in sauce, which gets all caramelized and piping hot while cooking, turning into the best version of sauce that you'll ever have. Thrillist's Deputy Editor Matt Lynch is from Chicago, lives there now, and holds sway over our picks for the Midwest. But such is my enthusiasm for Pequod's that he kindly (begrudgingly?) leaves the spot open for me each year. This love began in the early aughts when I dated a Chicago native who lived within the delivery radius of said pizzeria. And so it became a tradition to order Pequod's whenever we'd returned from a bar or a party or eating at another pizza place. The beauty lies in that damn crust, which is cooked in a cast iron pan and caramelizes into this crunchy handsome thing that's making my mouth water as I type. If you ask for the "Kevin Special," they will pretend they have no idea what you're talking about, so maybe follow up by explaining that it's actually just sausage and green olive. Pizzeria Beddia won't make it easy for you to grab a bite of its pies: there's no phone, it's only open four days a week -- and even then only five hours -- and there are only 40 pies sold each day. So, get in line long before the 5:30pm open time, and don't bring friends -- seriously. It also limits two pies per party, and you're going to want all of those to yourself. Get a basic tomato and mozzarella pie and a pizza with spicy Arrabbiata sauce, and layer on the toppings. 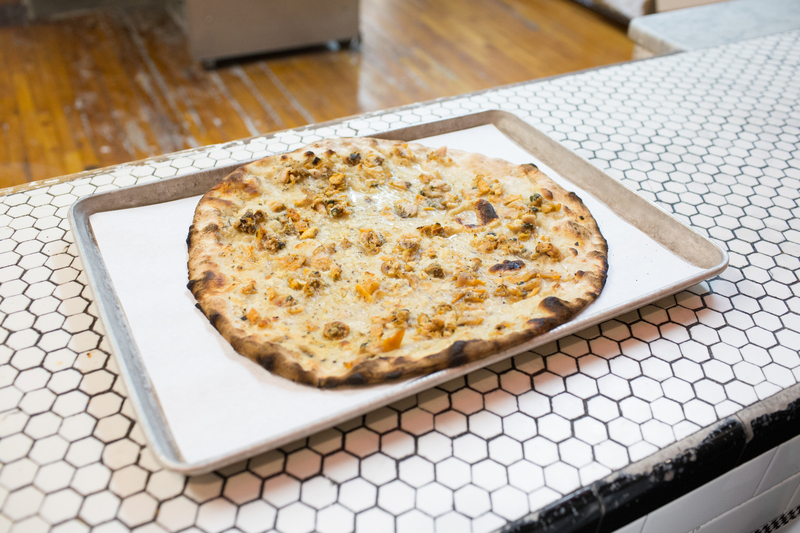 It's simple -- seriously, don't expect fancy toppings -- and that's the beauty here: Joe Beddia took the lessons of simplicity from some of the legends of America's pizza scene, learning from the men behind Di Fara and Pizzeria Bianco (both on our list) to create this tiny pizza destination. Philly, if you've been waiting for a reason to call in sick to work, this is it. Getting a spot in line is truly that important. We say it every year, and we'll continue to say it every year until the drones eventually take over: having a best pizza list without Chris Bianco's pizzeria would be like having a school with no teachers. 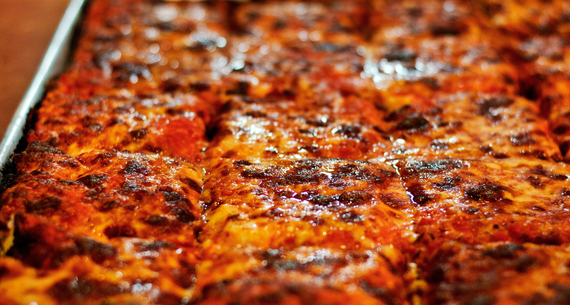 The man is almost singlehandedly responsible for starting the pizza renaissance in America and has inspired many of the chefs also on this list. But if you require some sort of timely hook to get to Arizona, fine: he now has an outpost in Tucson, too. First off, this is not Detroit-style pizza. 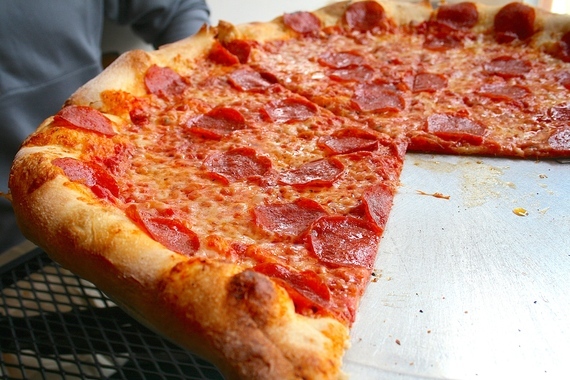 This is more like a pizza you might find in New York. Second, you won't care about that distinguishing factor once you bite into its signature Supino with roasted garlic, black olives, chili oil, ricotta, and mozzarella. Third, and perhaps most importantly, it says "trill tomatoes and all that good stuff" on its damn menu. We've said it before, and we'll say it again: you see the menu at Tony's, and you think, "This is crazy. There are too many styles of pizza and too many options. 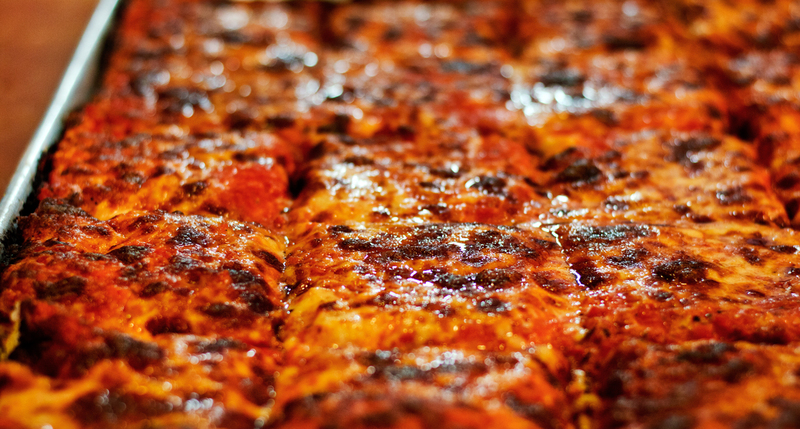 Can he really pull off a Detroit pizza, and a Jersey tomato pie, and a Napoletana, Romana, and Sicilian? Plus a coal-fired New Haven style? AND A ST. LOUIS?" Yes. Yes, he can. 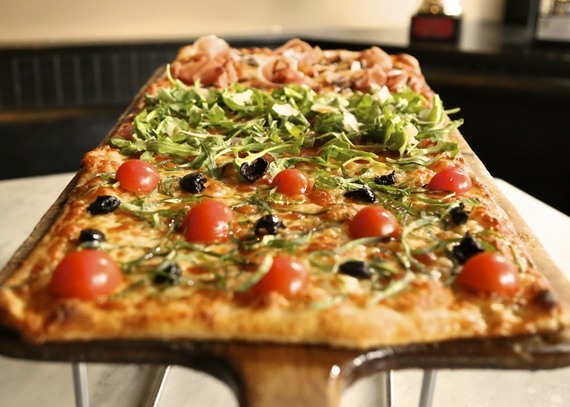 And each style would give the best pizzas in whichever particular region they come from a run for their money. 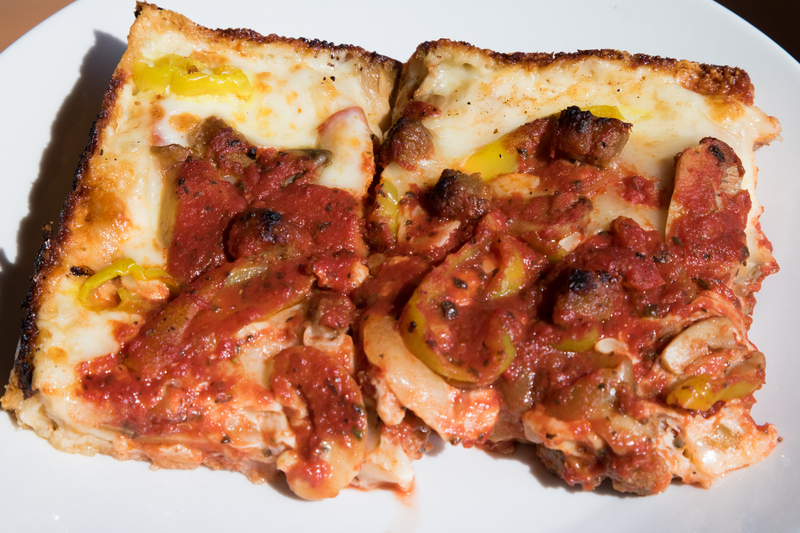 And if Tony's doesn't offer up enough styles for you, head to Capo's down the street, his take on all of the Chicago-style pies. It must make every pizza place in Austin go crazy when they realize their best pizza comes out of a truck in front of the Violet Crown Social Club. And it must make everyone in Detroit crazy to think that some of the best iterations of their pizza are coming from a food truck in Austin (though, to be fair, it was started by Detroit expats). And it does make me crazy thinking about how fantastic the Detroiter (smoked pepperoni under the cheese, more on top) is, and how I want to order another right now and ship it to Cali. 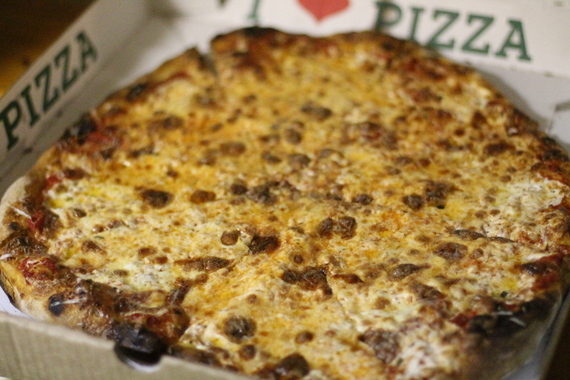 Bonus: don't sleep on its "bar-style" pizzas, which are in the traditional tavern style. Especially the one with ham and maple syrup. We cannot say it any stronger or in a way that better lets you read about VIPizza in a Queens accent than our freelancer John Houlihan once did, so we leave you with his words: "VIPizza on Bell Blvd in Bayside serves up the best Sicilian slice I have ever eaten. EVER. They've torn down and rebuilt since I was a kid, so of course you get all these jadrools who think they know something: 'It's not the same as it was, cuz!' 'My Uncle Lou said it used to be the best, but now it's just okay.' B.S. It's incredible. It's awesome. Be quiet. Thank you. There's a good reason it's been in business for half-a-friggin' century. "There's no reason to get a regular slice at VIPizza. I'm sure it's probably great, but I've never had one because, WHY? So many places have a low turnover on Sicilian. It's the most hit-or-miss thing in the world. Either it doesn't heat up right because it's been sitting out too long, or they don't put enough effort into it because they don't sell as many... whatever the problem, VIPizza doesn't have it. Perfect Sicilian slice. Marone." Despite the national attention paid to the heftier deep dish, this is the kind of pizza most Chicagoans were raised on: thin, cracker-y crust cut into smaller squares (making it all the more easy to talk yourself into "one more piece"), and nobody does it better than Vito & Nick's, a South Side institution that hasn't changed in decades, other than maybe adding some new plaques from the local Little League teams it sponsors. 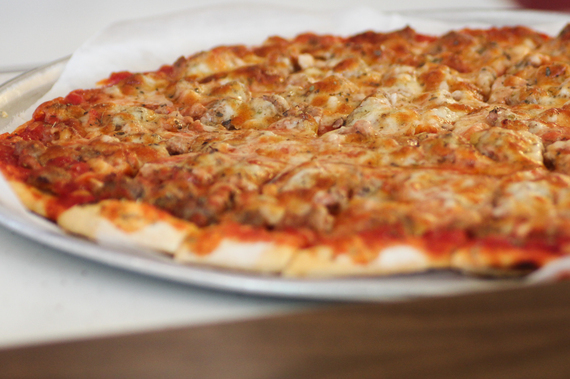 Get yourself a sausage pizza and a pitcher of Old Style and experience a true Chicago legend. To find out which pizzerias round out our list of the 33 best ones in the country, get the full story at Thrillist.com!